I'm sure most of you saw the headline: "Vermont Man Kills Himself After Fatally Shooting Friend in Deer Hunting Accident" It is every hunters nightmare. Basically, three men wounded a deer and were tracking it. There is little information, but one of the men, Mr. Bolognani, either saw or thought he saw the deer and fired. Instead of hitting his intended target he hit his long time friend, Mr. Birch, killing him. Distraught over accidentally killing his friend, Mr. Bolognani shot and killed himself. None of the news articles I found commented on whether or not they were following game laws, including blaze orange, so I am going to assume they were following all the laws. I think there is no reason to believe that they were doing anything unsafely, this was simply an accident. Our hobby, hunting, is a very safe one. The chances of you getting hurt while hunting is very low. I think one of the big reasons for this is that everyone involved is well aware of the dangers. The most dangerous times are during the excitement of the hunt. When following running game, trying to flush birds in sight, or when tracking a deer. These are the times when someone gets hurt. A long time ago I was part of a group of good guys that went camping\hunting\fishing in the blue mountains of Oregon. We went way back into the woods. We traveled two hours on old back logging roads, having to move downed trees, and then hiked a couple miles into a valley. It was an awesome trip! Our quarry was ruffed grouse and they were abundant. My shotgun had been damaged on the hike in, so I was using a Rugger 10/22. Some may say it is unsporting to use a rifle against a bird. 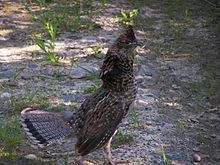 I say, for ruffed grouse, it is more challenging. You have to be very quick to shoot them before they flush, and they rarely sit still. Look at the perfect camo on this guy! We were walking along a trail, single file, when off to our left I saw movement in the brush. A quick glance through the scope confirmed that it was a grouse. After the shot I quickly dove into the brush to retrieve my kill. I've had way to many down birds get up and run away to doddle while retrieving them. The brush was thick, I had to crawl on my hands and knees to get through it. I approached the still twitching bird and reached out to grab it when it exploded! One of the hunters I was with saw the bird, did not realize it was the one I had shot, and shot it. The brush was so thick he did not see me. I was not hurt, but I was shaken. It was a startling reminder of how things can go bad quickly when the cover is thick and a group is pursuing game. That incident has stuck with me through all these years. I am now very, very careful in the brush. Accidents happen. When high powered rifles or buckshot is involved the accidents can be devastating. I hate that Mr. Bolognani felt so bad for accidentally killing his friend that he felt that killing himself was the only answer. I don't know what I would have done in his situation, but I'm sure that suicide would have at least entered my thoughts. There is nothing good with this story. No positive spin. Two lives and families were destroyed. The bad press hurts hunters everywhere. How many well meaning, but ill-informed, mothers will not let their sons hunt after reading this? Lets just all take it as a sobering reminder to stay safe out there.